We all know a great number of dumb things get said on twitter. It’s also well known that at times, working in the food service industry can be a trying experience. I don’t know what it is, but people have this tendency to get all uppity about their food. And when that happens, the customer service agent will usually serve the customer with a smile and then engage in a complaint-fest with his co-workers after hours during cleanup. 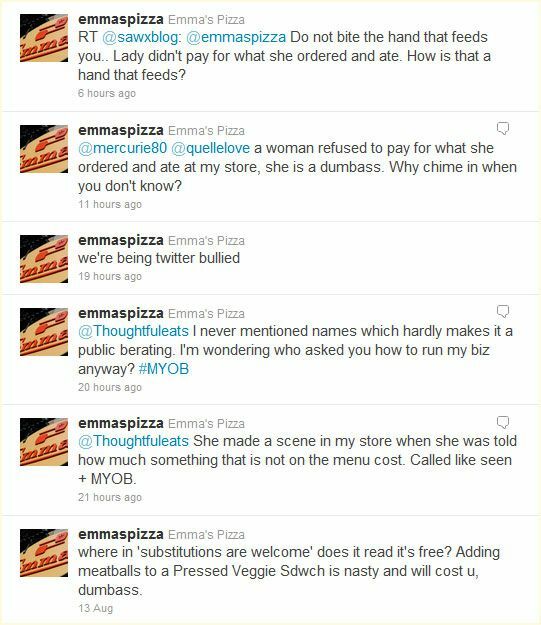 In this case, the voice of the company’s twitter account (turns out it was the owner) went a little further and took his complaint public, calling a difficult customer a “dumbass” (see bottom tweet for start of conversation). If this was an individual’s twitter account, I’m sure this largely gets ignored and forgotten. But in using the business’ account, he essentially advertises that his business has no problem publicly calling out its customers. And customers see that if you’re willing to call them dumbasses, you’re also probably willing to spit in their drink. That’s something that will drive customers away, and in this economic environment, nobody can afford that. The business owner, Jeff, does come out and apologize for the whole mess, and I’m sure he wishes he could take it all back, but that’s the problem with putting things in print, especially in the internet age -- once it’s on the internet, it’s forever. So how do you handle dumbass customers? First, step back and take a deep breath. If you want to tweet about it, then do so in a way that gains empathy from your audience. Treat your twitter followers like a sounding board and without being mean, explain the situation and ask your audience what they would have done. Who knows, you might even learn a thing or 2. As far as damage control goes, apologize and offer an olive branch. Perhaps you offer a discount off a future order or something of that nature. Show people remorse and a reason to forgive, and by and large people will oblige.